There was no picnic table, but a construction of logs gave us some height to build on with our crates. Forgive us if this all seems a bit over the top for a canoe trip. We've got thirty years of family camping behind us and the old ways die hard. We also didn't feel like investing in all new, light-weight gear for a trip that might just be a one-off. We considered the options carefully when we were planning and it became obvious that one canoe load of gear would not support us in the style to which we were accustomed. Then, when we reached the tipping point of needing a second load, we didn't hesitate to make it worth our while and fill it up. We had camped at Canisbay Lake before and had seen that loading up the canoe required only a short carry from the parking lot. And we wouldn't have to portage to get to any of the campsites. So no herculean efforts were required. Otherwise we might not have had three crates with us - they're great to pack odd's and ends into, but a bear to carry over long distances. So we say to anyone considering interior canoe camping; don't let your lack of "approved" gear stop you. 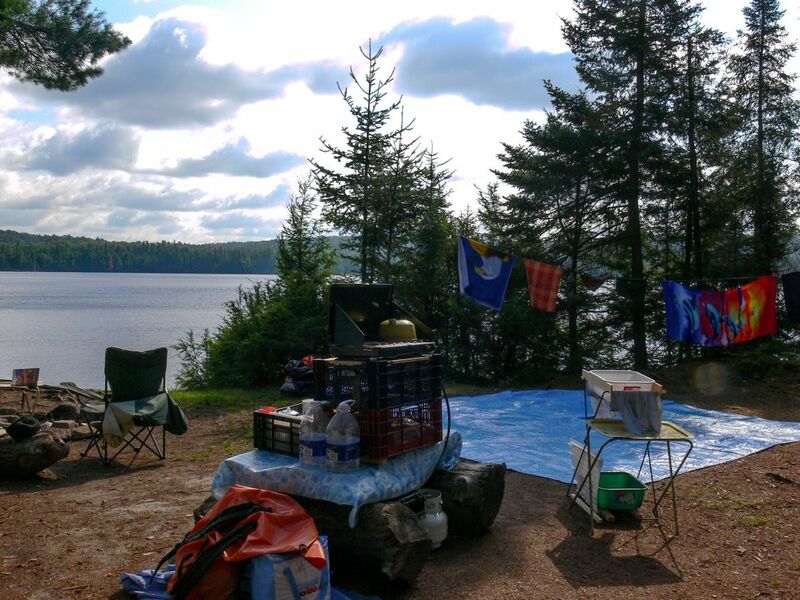 You can still enjoy the experience as long as your campsite doesn't require a long paddle and/or a portage to get to it.